Fjola's Wonderland: HOW TO TIGER NAILS !!!! HOW TO TIGER NAILS !!!! 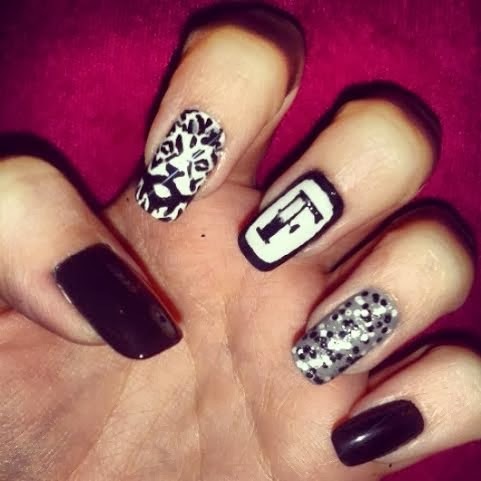 After this ste is time to do one of the white ones .Pick any alphabet font you want for this look and then with a black nail polish frame it. And your done!!! Well. now comesthe difficult part of all this nail art which is the tiger head. I'll admit it...I found it hard too till I found a way to create this tiger head look too. SOOoo, what you have to do ,is first to create thebase of the tiger head which is the mouth.Start creatine a Y letter. Up to theY make a small C letter.When you create this base thne the rest are easy ...cause is just lining on the right directions that you can watch on my video here. When your done waittill the polishdry andthen use a generous top of top coat!!! IF YOU RECREATE THIS LOOK PLZ SEND ME PIC ON MY PROFILE ON INSTAGRAM WITH HASHTAG!! !